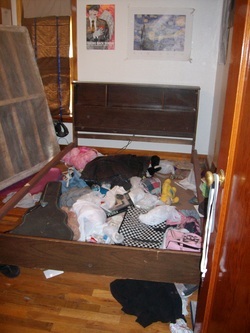 While my daughter was off working for the summer, I decided to surprise her by redecorating her room for her birthday. Being a single mom, I had to be creative and thrifty, but she was quite happy with the end result! The room really feels opened up with bright colors and new window coverings. I also took the opportunity to provide some organization by adding some storage and storage organizers. Clothes covered the floor and posters covered the walls. There was also only about a foot to get around the end of the bed to get into the room, making for a lot of barked shins. So, after a lot of sorting and throwing away, I turned the bed so the headboard was against the wall in the right side of that picture. Did I mention I had to move that mattress and boxsprings by myself? Yes! I have a black toenail to prove it! 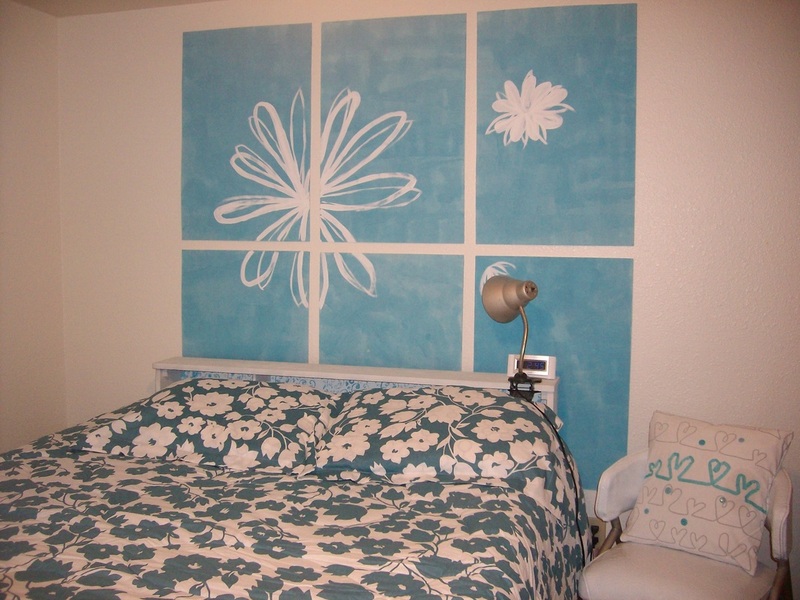 The whole project cost me about $100, which included: the new comforter set, material for the bedskirt, 2 shelf sets for the closet, the stenciled white cabinet, a new rug, shades for the windows, embellishments for the pillow and paint! New bedding, refinished chair and a fluffy white rug bring the bed area together. I repainted the lamp nickel to match the chair legs. 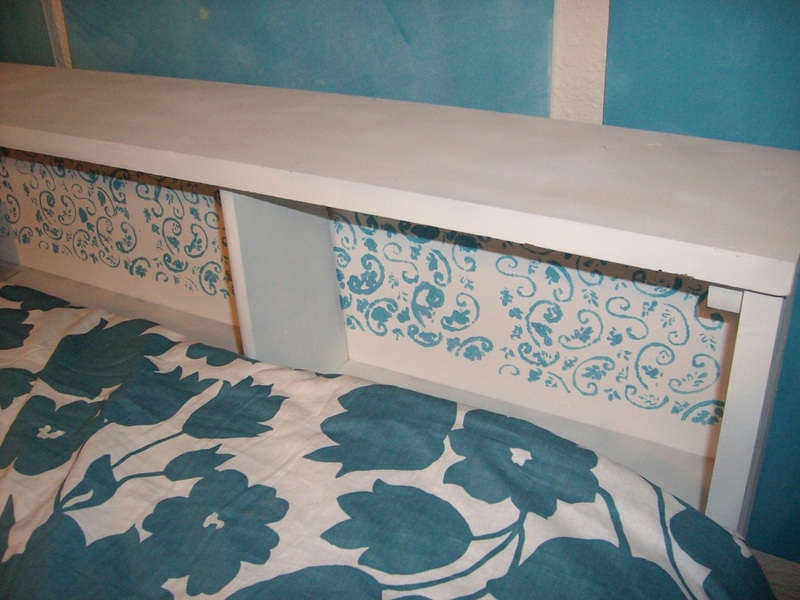 I painted this old vinyl chair white and with nickel legs to match her shelving unit, then made this pillow from the material I used for the bedskirt, and added the ribbon and button embellishments. 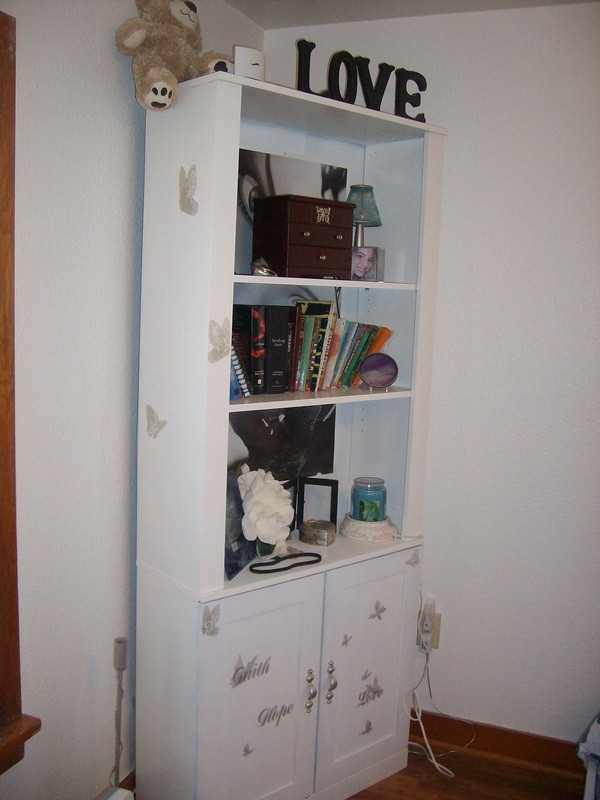 This was my very first time ever stenciling with spray paint, so it is a little rough, but it dresses up the plain white cabinet nicely! 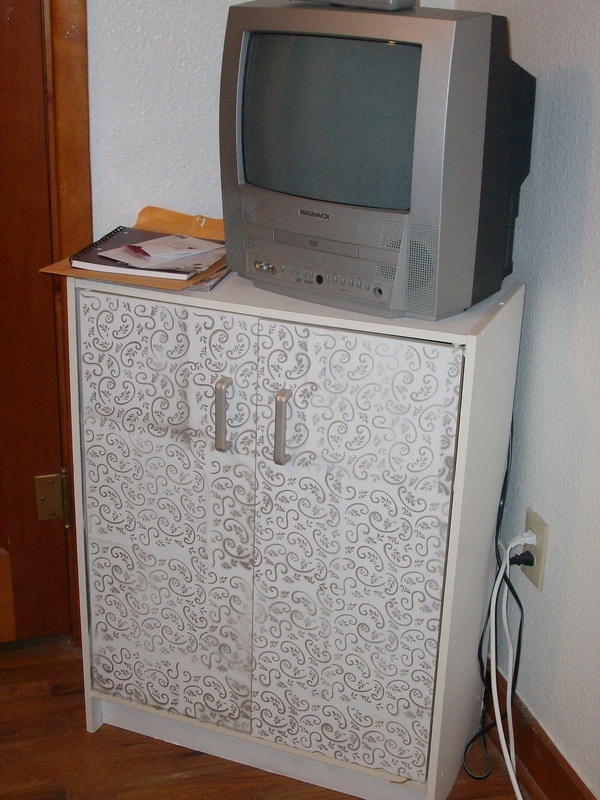 Again using nickel spray paint to match the other hardware in the room. 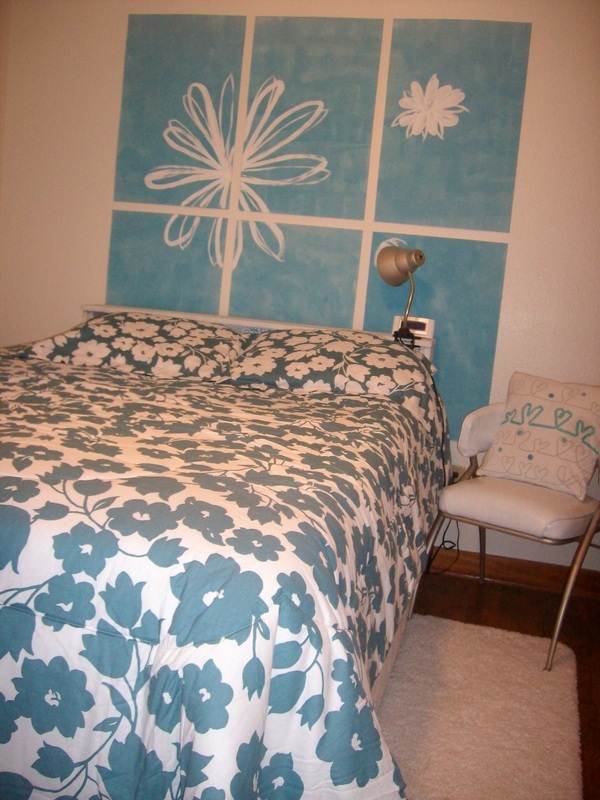 This is the old brown headboard shown in the before picture! 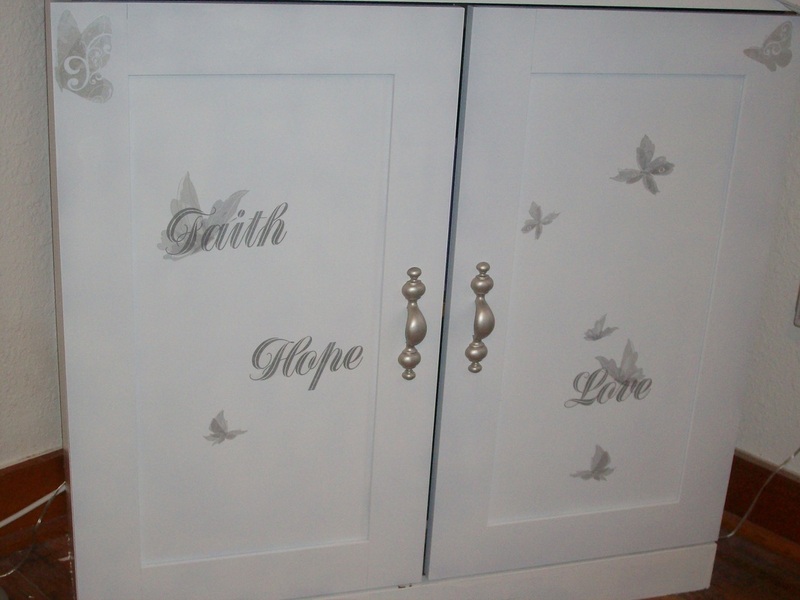 A coat of white base, then stenciled detail inset using the same stencil as the white cabinet. My daughter actually said "Is that my headboard?!" Again painted the shelving white to brighten and lighten the room, then added these stickers to dress it up. 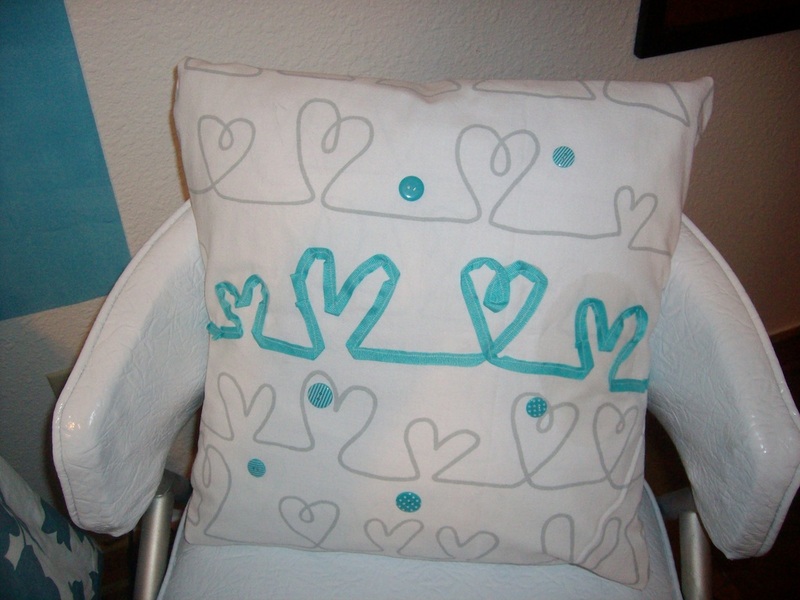 They look like stencils, very nice product! Previously dark and bulky, now a nice addition to the decor! This is some really cute artwork Beth had done. I used the same ribbon idea to hang it, bringing the poster and artwork some unity. This was a poster she already had. 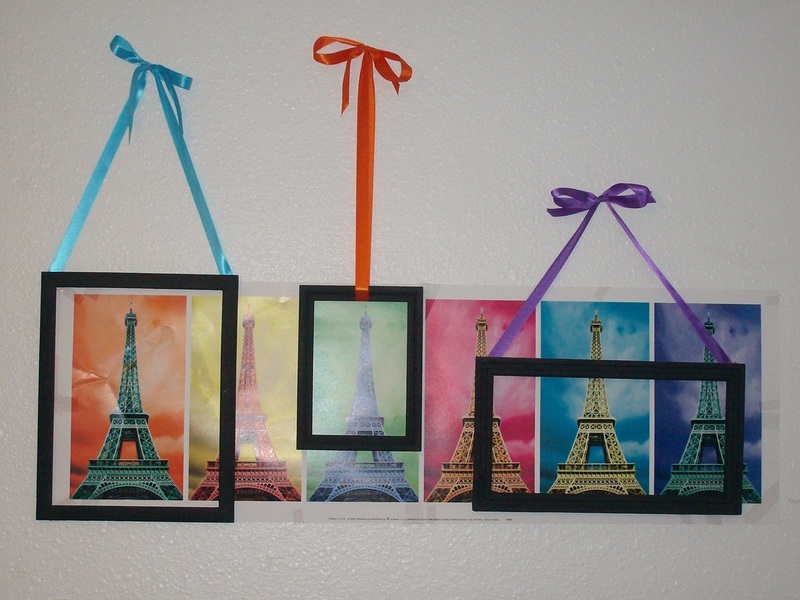 I used the ribbon and frames to dress it up. My 3 yo granddaughter was really impressed!